Ash the mountain lion turns three this month! He was less than thrilled with chicken necks for his birthday. Looks like we’ll be birthday shopping for something fancy like a duck or maybe a turkey! A boy’s gotta have something special for his 3rd birthday, right? 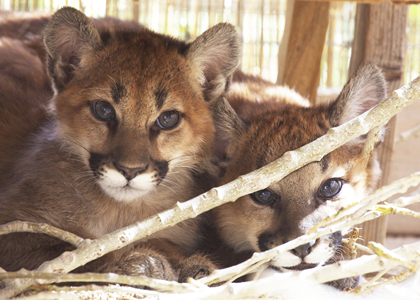 Ash is a happy, healthy young mountain lion now, but the beginning of his life was tough. Ash and his sister Cypress were only a couple of months old when their mother was legally killed in California, leaving the cubs to survive on their own. Cypress was found first, badly injured from a confrontation with a dog. Two legs were broken, her jaw fractured, teeth broken and bite wounds were infected. She was emaciated, weighing only 7 lbs., and too weak to eat on her own. 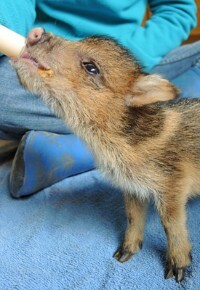 The California Fish and Game Department arranged for the Folsom City Zoo Sanctuary to care for her on a temporary basis. Nearly a week passed before Ash was found up a tree at the same location. He was uninjured, but close to death from starvation. Once placed in the same room, Zoo officials said the cubs quickly began to vocalize to each other and perked up considerably. The siblings were reunited. The Folsom Zoo wanted to keep the cubs, but only had space for one. They didn’t want to separate them because they were so bonded. Southwest Wildlife offered a home where the cubs could remain together and heal. They arrived in early 2012. At our sanctuary, Ash grew and blossomed, but sister Cypress struggled to get well. We fought along with her for a year, hoping for a miracle. With the help of wonderful volunteer vets and the advice of many experts, she would rally and get better, but each improvement was followed shortly by another downturn, and she finally made it clear that she couldn’t fight it any longer. Last year we helped her to find peace. Ash missed his sister, but found comfort from Giselle, one of the older female mountain lions he lives with. They can often be seen lounging together and seem genuinely fond of one another. His other roommate, Maya, isn’t very tolerant of bouncy, teenage boy-behavior and Ash has learned to respect her space. Happy Birthday you handsome young man! And many more!